Highlights include “Mental Illness as Mating Ritual,” where the guitars sound like they’re literally pushing the amplifiers to the brink; “I See You Are Also Wearing A Black T-shirt” that has an industrial-ish sound and some killer drumming; and “Ghost Trash” and the closing track, “I Have a Prepared Statement,” that alternate some clean guitars among the churning distorted riffs. There are certainly some times where I wish the vocals and bass were louder in the mix. But, overall the album is consistently good. I do want to take issue with the album art. I don’t really have a problem with the gold trashcan, but I think it would be better on a black background. Never mind what Kerry King will tell you about Slayer’s God Hates Us All cover, white is just weird for a metal album. 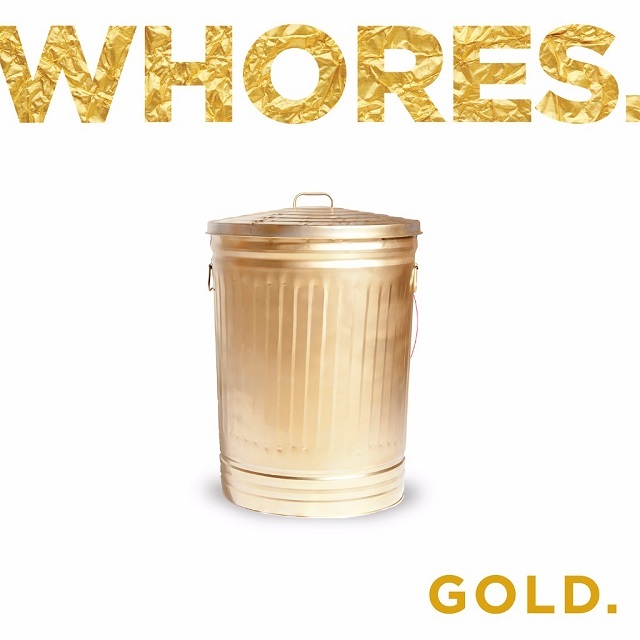 Also, why is the “Whores.” title layout bleeding off the edges just ever-so-much? Shrink it down a click. I would’ve also dropped the album title in the bottom right hand corner, but my biggest beef is the white background. Whores. have got the goods and are a rare “new” band we’re following here at the void report. If you’ve heard the bands previous releases, this is a satisfying full-album release. If you’re new to the band, it’s as good of a place to start as any and we recommended it. At first I was a little ticked off it was only 35 minutes, but there’s no use in adding songs for the sake of length. After a few days of listening to it and digesting the album, I think it’s perfect the way it is and it leaves you wanting more. Check out Whores. on tour with Red Fang. We’ll be at the November 26th show at Three Links in Deep Ellum. Stay tuned for our review of the show. Album Review, Gold, Metal, Music, Whores.